Houston is home to several craft breweries. One of my favorite is Saint Arnold’s. It is not only the oldest brewery in the city, but it is also the best. They have a wide variety of brews that will appeal to several tastes, and they often host fun and exciting events. I love to hang out there with friends, listen to music, and enjoy some great craft beer. But sometimes, I don’t feel like driving all the way across town to partake in one of Saint Arnold’s libations. The brewery is nearly 35 miles from my house, and Houston’s traffic is horrendous. It can take me more than an hour to get there on a good day. I must admit that I was skeptical at first. But when I entered the store and saw the wide selection of specialty beers on display, I was impressed. 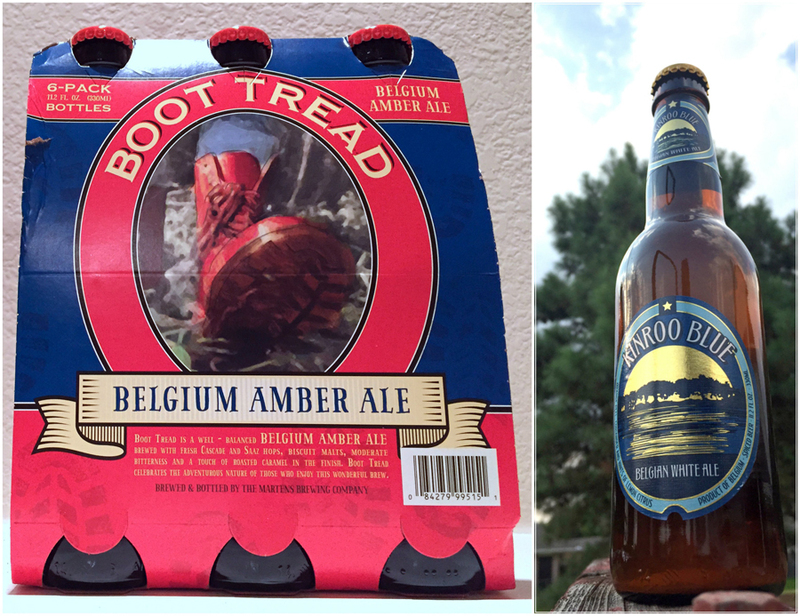 Let’s take the Boot Tread Belgian Amber Ale (5.20% alcohol), for example. Imported from Belgium, this well-balanced amber ale is brewed with fresh cascade and saaz hops, biscuit malts, moderate bitterness and a touch of roasted caramel in the finish. It pairs well with steak, poultry, lamb, game, fish, pasta, pizza, and cheddar cheese. I also sampled the Kinroo Blue Belgian White Ale. Also imported from Belgium, this beer is a perfect balance of orange peel, coriander and hints of lemon citrus with a crisp, refreshing finish. Garnish with an orange peel to add to your taste experience. Pairs well with light salads, seafood, bratwurst, mild cheeses, light desserts, or on its own. Since I love to cook, I decided to use these beers to create a delicious meal. Below you will find the recipe for my creation. Place steak in a baking dish and season steak with allspice, peppercorns, sea salt, and garlic powder. Pour Boot Tread Belgium Amber Ale beer over steak, cover dish with foil, place in refrigerator and marinade over night. 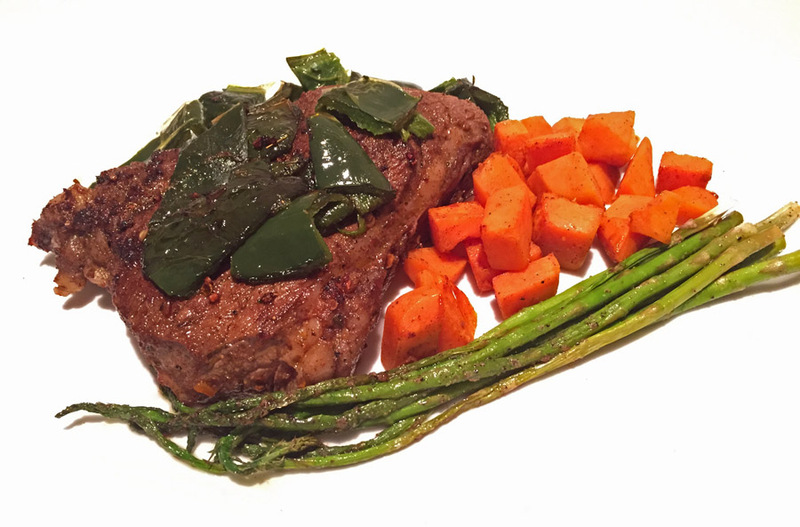 When you’re ready to cook steak the next day, remove from refrigerator at least 30 minutes before cooking. Slice one whole poblano pepper, place in baking dish, coat with olive oil and place in oven to roast for 20 minutes. Heat cast iron skillet on stove until extreme hot and add olive oil. Place both steaks in skillet and sear each side for 30 seconds. Reduce heat and continue cooking steaks. Flip steaks with tongs every minute for even cooking. Add about a 1/4 stick of butter and sliced poblano peppers to skillet. Baste steak with butter and cook until desired doneness (rare, medium, well done, etc). Remove steak from heat and allow to rest for 3 minutes. Peel sweet potatoes and dice. Heat skillet on stove. When skillet is hot add butter and sweet potatoes. Season potatoes with salt, pepper, and cinnamon. Sautee the potatoes until they start to get tender. Roast asparagus with salt, pepper and olive oil. Although this meal took some time to prepare, it was well worth the wait. 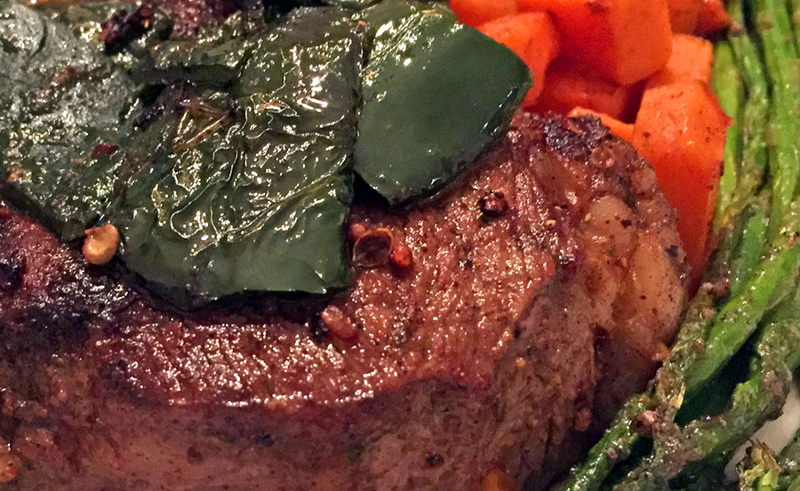 Because sirloin steak is so lean, it can be tough and dry if it isn’t prepared correctly. Marinating it in the Boot Tread Belgium Amber Ale not only made the steak tender and juicy, but it also gave it a bold flavor profile that worked well with the seasoning and poblano peppers. The sweet potatoes also benefitted from being cooked in the beer. Kinroo Blue Belgian White Ale added an element of sweetness and citrus which was a perfect contrast to the steak’s spiciness. Leave a comment below explaining what type of recipe you would make with craft beers from ALDI.